ONLY 285 IN THIS LIMITED EDITION! Now Sold Out from publisher! 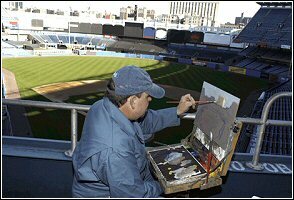 Thomas Kinkade paints the home of Babe Ruth -- Yankee Stadium! ++++ RARE! This edition is limited to only 285 in the world! ++++ This edition is SOLD OUT FROM THE PUBLISHER! 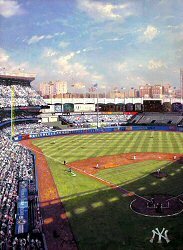 ++++ Brass Plaque with the legend "Yankee Stadium ~~ Thomas Kinkade"
"No one ever forgets their first visit to Yankee Stadium - I certainly remember mine. The color, the noise, and the nearness of history ... the spectacle takes your breath away. 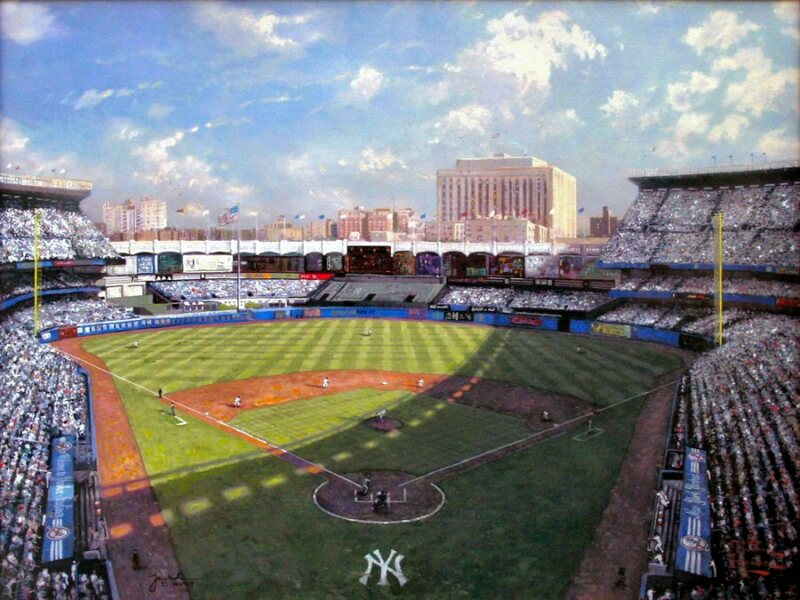 In 2008, Yankee Stadium, the greatest cathedral to the game of baseball, will close its doors forever. I could not let such a historic moment pass without honoring it in my way. 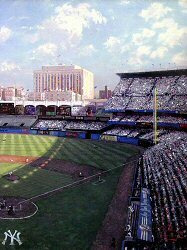 This is the original Yankee Stadium - the house that Ruth built. 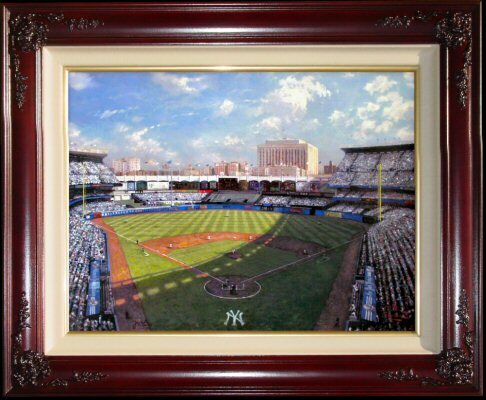 Because this is a distant view, you can people the field with Yankee heroes of your choosing. Could that be Lou Gehrig on first base? 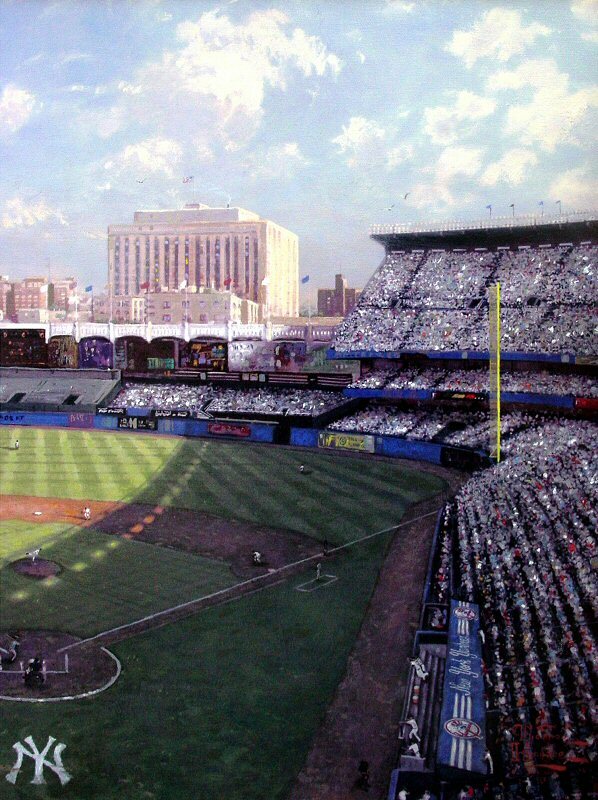 Babe Ruth in right field? Joe DiMaggio patrolling center? 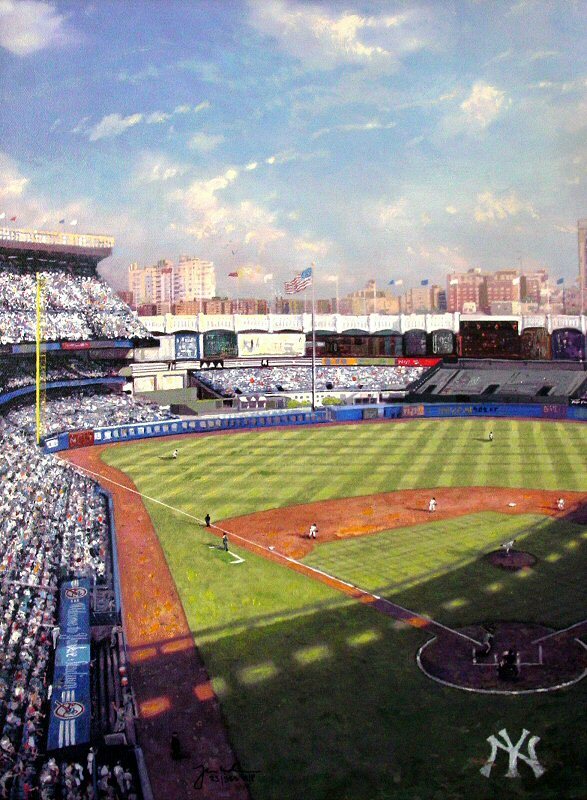 For eighty-five years, some of the greatest players in the game have called Yankee Stadium home." Then Disneyland asked him to commemorate their 50th Birthday with a "Disneyland 50th Anniversary" Disneyland painting in 2005. Elvis Presley Enterprises asked him to commemorate the 50th Birthday of "Graceland" earlier in 2007 as "Graceland" was acquired by Elvis 50 years ago. Thomas Kinkade is a modern day Leonardo da Vinci and is the world's most collected Artist.